The Basilique de Saint-Denis, just north of Paris, is a magnificent Gothic cathedral that is the burial place of French kings and queens. St-Denis is one of the most recognizable of the saints, always portrayed carrying his head under his arm. Legend says that after he was beheaded, he picked up his head and walked north, to what is today the Basilica Cathedral of Saint Denis (map). Just 10 kilometers (about 6 miles) north of Paris, it is easily reached by métro. From King Dagobert, who was buried there in 639, to Clovis, the first Christian Frankish king, and on through François I, Louis XII and Anne de Bretagne, and even including Louis XVI and Marie-Antoinette, St-Denis houses a remarkable walk through French history. 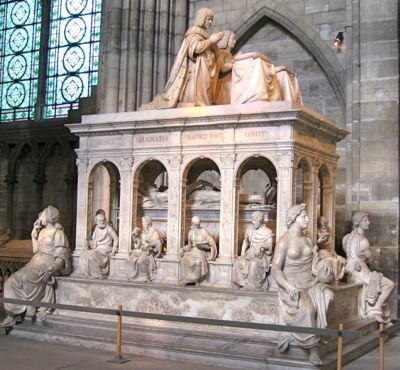 As was the custom, Louis XII and Anne de Bretagne are shown inside the tomb, "dead, naked, and flayed," and also alive, seated, and praying on the top of the tomb. Today St-Denis is a working suburb of Paris, with a significant immigrant population. It is also home of the Stade de France, a huge stadium built in 1998. It hosted the World Cup that year and is used for other sporting events and concerts. 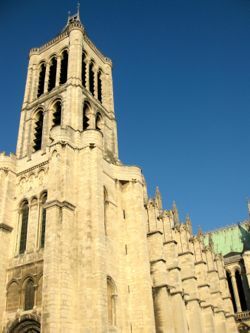 Above, Soaring single tower of St-Denis. 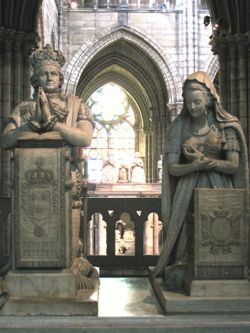 Below, Praying statues of Louis XVI and Marie-Antoinette.